Aerial view of Lodi Point State Park and environs from south by southwest, 2013. Lodi Point can be seen near the center of the photo. Lodi Point State Park (also known as Lodi Point Marine Park) is a 12-acre (4.9 ha) state park in New York State, United States. The park is in the Town of Lodi in Seneca County. Lodi Point state park is on the east shore of Seneca Lake, one of the Finger Lakes. The park is primarily a boating access point to Seneca Lake, lying west of the Village of Lodi. The park offers picnic tables, a playground with pavilions, a boat launch, and a marina. ^ "Lodi Point State Park". NYS Office of Parks, Recreation & Historic Preservation. Retrieved October 1, 2016. ^ a b "Section O: Environmental Conservation and Recreation, Table O-9". 2014 New York State Statistical Yearbook (PDF). The Nelson A. Rockefeller Institute of Government. 2014. p. 673. Retrieved February 27, 2016. ^ "State Park Annual Attendance Figures by Facility: Beginning 2003". Data.ny.gov. Retrieved October 1, 2016. 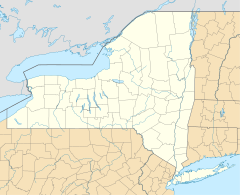 This article about a location in Seneca County, New York is a stub. You can help Wikipedia by expanding it. This page was last edited on 1 August 2017, at 14:29 (UTC).